I've created a Wineskin wrapper for @Troodon80's EE Keeper, and I'm happy to share it with other Mac users out there. Note about OS X's GateKeeper. If you try to launch EEKeeper and get an error saying its not from the Mac App Store and its not digitally signed, then the first time you run it, you need to right click (secondary click) it, and select the "Open" option, and it will ask if you are sure that you want to open the app. Press OK to confirm. After opening the app once this way, you should be able to open it normally. For version 1.0.2.6+, you will need to create profiles for each game and set the installation and user data folders for each profile. The locations of these folders may depend on the source you purchased the game from. They both can be a bit tricky to find. So, I'd like to compile a list of locations here for everyone. The "Installation Directory" is the folder which contains the CHITIN.KEY file. On OSX versions of BGEE/BG2EE/IWDEE, this folder is actually inside the game's app package. The "User Save Data Directory" is the folder where the game's "save" and "portrait" folders can be found. The Beamdog install creates a link to this folder in your Documents folders. I'm not sure if other installs do this. If not, the folder can be found in your Library folder (which is hidden by default in OSX). Where USERNAME is your OSX username. Many thanks to @Troodon80 for all the work on EE Keeper! UPDATE 03-DEC-2013: EE Keeper version 1.0.2.2 has been released with Unicode character support. The Wineskin wrappers have been updated to this latest version. UPDATE 26-JAN-2014: EE Keeper version 1.0.2.3 has been released with a fix for saved games in the Pocket Plane. The Wineskin wrappers have been updated to this latest version. UPDATE 18-JUN-2014: EE Keeper for OSX version 1.0.2.4 has been released. UPDATE 09-NOV-2014: EE Keeper for OSX version 1.0.2.6 has been released. UPDATE 28-FEB-2015: EE Keeper for OSX version 1.0.2.8 has been released. UPDATE 21-MAR-2015: EE Keeper for OSX version 1.0.2.9 has been released. UPDATE 28-MAY-2015: Updated folder location information. UPDATE 23-JUN-2015: EE Keeper for OSX version 1.0.3.0 has been released. UPDATE 06-JUL-2015: EE Keeper for OSX version 1.0.3.2 has been released. UPDATE 25-OCT-2015: EE Keeper for OSX version 1.0.3.2a has been released. UPDATE 25-APR-2016: EE Keeper for OSX version 1.0.3.4 has been released. UPDATE 18-DEC-2016: EE Keeper for OSX version 1.0.3.6 has been released. UPDATE 20-JUN-2017: EE Keeper for OSX version 1.0.4.0 has been released. UPDATE 26-NOV-2017: EE Keeper for OSX version 1.0.4.0a has been released. I needed to change my bgee directory to 00774, but otherwise it seems to work fine. Thank you. BTW, do you have the beta version or Mac Store version? Just curious why your install uses the 00774 directory. I use the Beamdog installer. I played with the beta and updated to the final patch when it went live. That might explain the different number in the Game Data directory. I only ever had the release version (non-beta) with the Beamdog installer. @Troodon80 has released a EE Keeper version 1.0.2.2 with Unicode character support. The Wineskin wrappers have been updated to this latest version. See the first post on this thread for download links. I have the Mac store version but am new to Mac OS and have no idea how to specify the installation directory. Any suggestions? I don't have the Mac App Store version, but I think it installs the BG:EE/BG2:EE app directly into the Applications directory. Select "Settings -> Installation Directory" from the application menu bar (not the OS X menu bar). Click on "Browse BG:EE" or "Browse BG2:EE", depending on which game you want to set up (if you have both games, do both). This should bring up a "Browse for Folder" window. 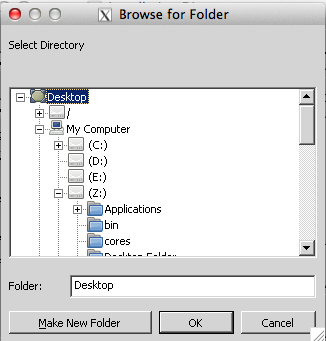 Click the "+" symbols to expand the selection tree to "Desktop -> My Computer -> Z: -> Applications". 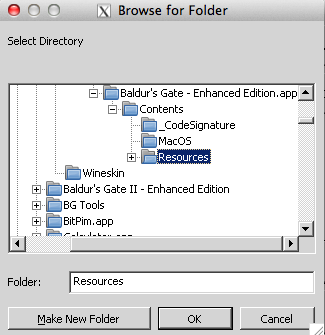 Then, find "Baldur's Gate - Enhanced Edition.app" (or BaldursGateII-EnhancedEdition.app") and click the "+" symbol to see the folders inside the app package. Find the directory "Contents -> Resources" inside the app package. Select the Resources folder and click "OK". ...but nothing happens when I click 'ok.' What am I overlooking? Thanks. EE Keeper is looking for a save game in the following location: "Documents\Baldur's Gate II - Enhanced Edition\save"
The Beamdog installer creates a link to the directory "\Users\USERNAME\Library\Containers\com.beamdog.baldursgateIIenhancededition\Data\Documents\Baldur's Gate II - Enhanced Edition\" in your Documents directory, letting EE Keeper find the save directory. Unfortunately, it looks like the Mac App Store version doesn't do this. and then click OK. Don't try to pick a specific save. Just point EE Keeper to the "save" directory. Problem I have: BG2EE doesn´t load the edited savegames, they don't appear in the list when I want to open at all. I have verified, files are written in the same path as the rest of the gamefiles with next higher game number. 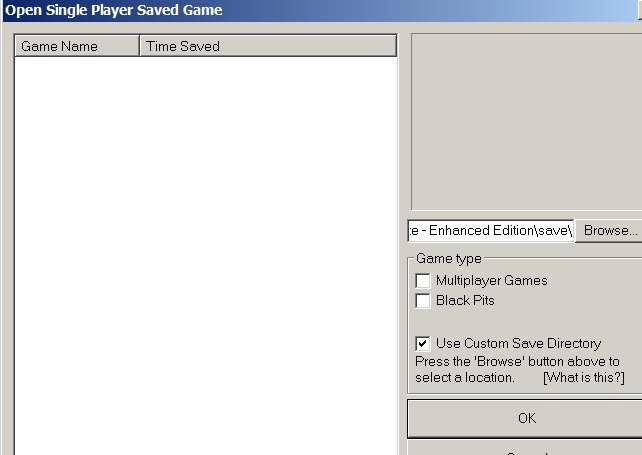 I have also copied the folder content of the newly created savegame into the folder of a game that is normally loadable from BG2EE -> but when I do that the savegame is no longer listed. @Skaffen - Are you running the OS X version of BG2EE, or are you running the Windows version on OS X under Parallels? @AstroBryGuy OSX version of BG2EE. Not having to boot windows was the major driver to move from a working GOG installation to EE. @Skaffen - I don't have Parallels, I run EE Keeper on OS X via Wine. So, I'm not sure how Parallels could affect the game files. There's a link at the top of the thread to the latest Wineskin wrapped version of EE Keeper for OS X. @Troodon80 has released EE Keeper version 1.0.2.3 with a fix for saved games in the Pocket Plane. The Wineskin wrappers have been updated to this latest version. See the first post of the thread for download links. @Troodon80 has released EE Keeper version 1.0.2.4. The Wineskin wrappers have been updated to this latest version. See the first post of the thread for download links. Unfortunately it does not seem to work anymore (at least) when EEKeeper is downloaded from the Mac Store. The format of the folders/files look different (eg folder called now /characters). Also EEKeeper does not see recognize the save files located in the /save /mpsave /bpsave folders even using the custome save directory. The /characters folder is where exported characters would go, or where you would copy .chr files you want to import into the game. It's not new, but I think it isn't created by the game until you export a character. If you want to import a character, create it yourself in the same folder where the save folder is. Unfortunately, there is only one Custom Save Directory, and it is used by EE Keeper for both BGEE and BG2EE. So, if you're playing both games, you'll need to change up your custom save game directory. OR - you can create the symlinks that the Mac App Store version of BGEE/BG2EE doesn't create. Wine doesn't like OSX Aliases, so you need to create Unix symlinks via the terminal. ln -s ~/Library/Containers/com.beamdog.baldursgateenhancededition/Data/Documents/"Baldur's Gate - Enhanced Edition" "Baldur's Gate - Enhanced Edition"
ln -s ~/Library/Containers/com.beamdog.baldursgateIIenhancededition/Data/Documents/"Baldur's Gate II - Enhanced Edition" "Baldur's Gate II - Enhanced Edition"
This should create the links needed in your Documents folder so that EE Keeper can see the save games without using the Custom Save option. Not sure if anyone else has noticed this, and it may be because of some oddities on my end, but the most updated EEKeeper (OS X 10.6.8, beamdog BG:EE and BGII:EE) crashes whenever I try to alter the number of spells I can memorize. Happens for cleric and priests, straight from the game without any other changes or mods. @misterid - I don't experience this issue when editing the Memorization tab. It could be a compatibility issue with your version of OSX and Wine. I'm running on Mavericks (OSX 10.9). I can update the Wineskin to the latest versions of Wine and Wineskin. Maybe that will help. EDIT: I see the issue as well. I'll have to see if I can change options in Wine to stop it. NOTE: It doesn't appear to affect 1.0.2.3. That looks to be working. Until I can figure this out, you can use that. So how do I update the Wine version? I downloaded it as the wrapper and I am not sure the settings that are on the Wine. If it is as simple as opening Wine and updating it I can do that, just want to make sure I don't need to make any changes to the wrapper and program itself after updating. I was making myself my own "shaman" by forcing a multiclass barbarian/cleric half-orc and wanted to up the memorized spells. I tried removing the options following in-game limits etc and still had the issue. Updating the Wine version didn't work. I still see the crash. I suggest using 1.0.2.3 until 1.0.2.5 is released. @AstroBryGuy‌ Oh, sorry, misread your post. Thanks, I'll start using that now. The Wineskin wrapped version of 1.0.2.4 for OSX should not crash on editting the Memorization tab now. Hi, I have been trying to get this to work on Mac for hours to no success. Followed everything pretty much to a tee, downloaded the wrapper and what not. Then when selecting BG1 "Cant Find Dialog.tlk" box appears EE unable to find text resources. So perplexed, I decided to look into my Icewind Dale 2 folder, following the same path (Contents\Resources etc) to find loads of folders in there with Languages. Also Icewind dale 2 is in Applications yet BBEE from steam is under my Users > Applications... it this an issue? The app at /Users//Applications/Baldur's Gate Enhanced Edition.app must be a launcher. IWD2 is from GOG, right? Different vendor, different way of packaging. Plus IWD2 is a Windows app wrapped in a Wineskin, BGEE is a native OSX app. Different beasts. I don't have the Steam download, but according to a post on stackexhange.com, Steam puts the actual game files at /Users//Library/Application Support/Steam/SteamApps/. Try looking there. The folder you want is the folder with the game's CHITIN.KEY file. I am on the verge of giving up!?! lol. Dont have Steam/SteamApps under that directory , so I typed a search for the CHITIN.KEY out of curiosity, and it found two files... which were in a folder I downloaded(dont remember what this is now, but Its downloaded recently) called gemrb-0.8.1 ... ring any bells? anyway the two CHITIN.KEY files were in there. Excuse my lack of ability here but im not all that snazzy with Mac's lol... back in the day had no probs with Shadowkeeper on the PC, but Mac's got me learning all over again. gem-rb is the open source implementation of the Infinity Engine. So, that's not BGEE. The /Users/%USERNAME%/Library/ folder is normally hidden. It won't appear in the Finder. 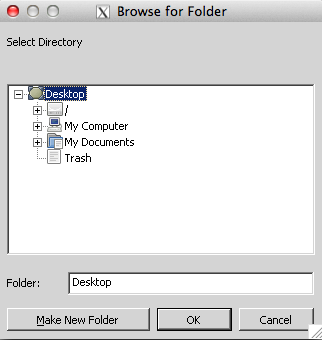 If you go fo the Finder, select the Go menu while pressing the Alt key, the Library will appear.